This weekend I chased Charmander. I saw (and captured) a Squirtle. I even ran with a Rapidash. It was glorious. Like many others my husband and I were swept up into the latest craze and I must admit: I’m loving every minute of it. It’s amazing to me to drive downtown and see dozens of adults of all ages trying to catch them all. I love the fact that strangers are suddenly talking and bonding with each other. This is the re imagining of a nostalgic trend in the best way possible. However, like all popular trends Pokemon Go is the target of reproduced (or rather inspired) merchandise. 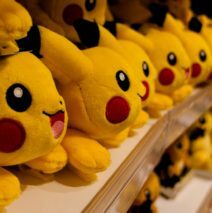 This blog post is a modified and expanded Facebook post I wrote up for several of the groups I administer on why it is not a good idea to start making Pokemon Go merchandise without a license. The topic was timely and focused on the sudden explosion of Pokemon everything, but the principles are timeless. The idea of profiting off of content that you do not own is unethical and illegal. The responses to those original threads were so volatile that we actually ended up closing the comments on one. This blog post is not to lecture or condemn. As with all of my posts it is to inform and hopefully make your day a little brighter. I find that copyrights and trademarks are often a source of confusion for my followers, so today is dedicated to shedding a little light on these buzzwords. There is a lot of emotion associated with these words and I understand that but the bottom line is if you do not own the rights to a character, phrase, lyric, song, picture, symbol, or any other commercial content, then you cannot sell it and profit from it legally. Everyone (it may seem) wants to get in on the action and in the past seven days there have nearly two thousand listings that have gone up using the keyword phrase Pokemon Go. If I simply type “Pokemon,” a startling 40,000+ listings come up. Now vintage sales are allowed on Etsy, but that is a completely different matter. Technically, anything older than twenty years (which means 1996) is considered vintage. This post is not about vintage sales. This is about knitting Pokemon hats or creating unlicensed T-shirts. This is about taking someone’s content that you do not own and profiting. Have you ever had a picture duplicated? It hurts. It hurts because it is your company and you pour your heart and soul into each and every concept. Some people will argue that Nintendo, Disney, and other big companies are so big that they should “share the wealth.” I think this is a flimsy argument at best. My goal as a copywriter and an educator is to teach my clients how to portray their concepts gracefully with words. You can’t very well be graceful during an act of theft. I’m curious to hear your thoughts on this latest craze and if you have ever been impacted by intellectual property theft.